Restaurants in any city form a delicate ecosystem. There are some that appear and then disappear quickly without a trace, cursed by poor location or an offer that doesn’t deliver. Others burst out through the bubble of social media into mainstream consciousness, blaze brightly for a short time and then fade (did I mention The Chiltern Firehouse). And then there is a small group of discreet places that service the technocrats, the remains of the aristocracy, the super-rich, the hedge fund managers and the media barons who control the lives of the rest of us. 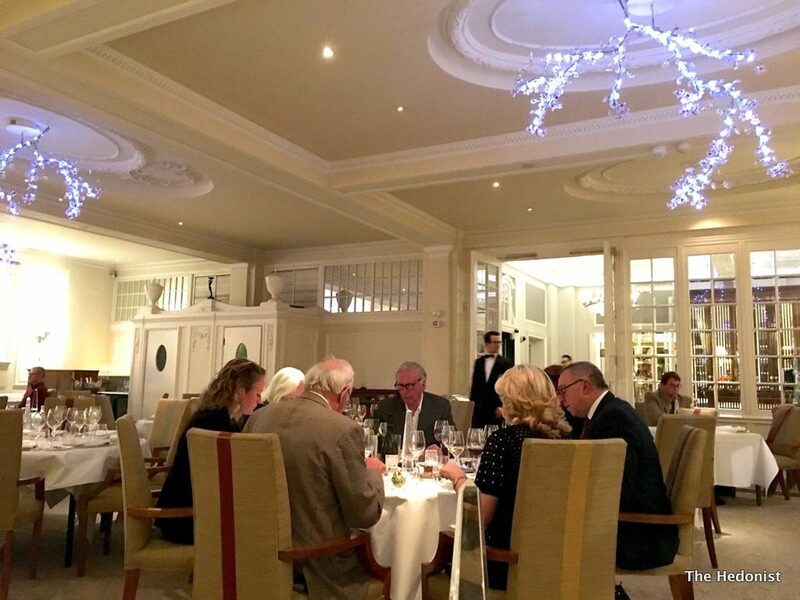 The Dining Room at The Goring is one of those places. 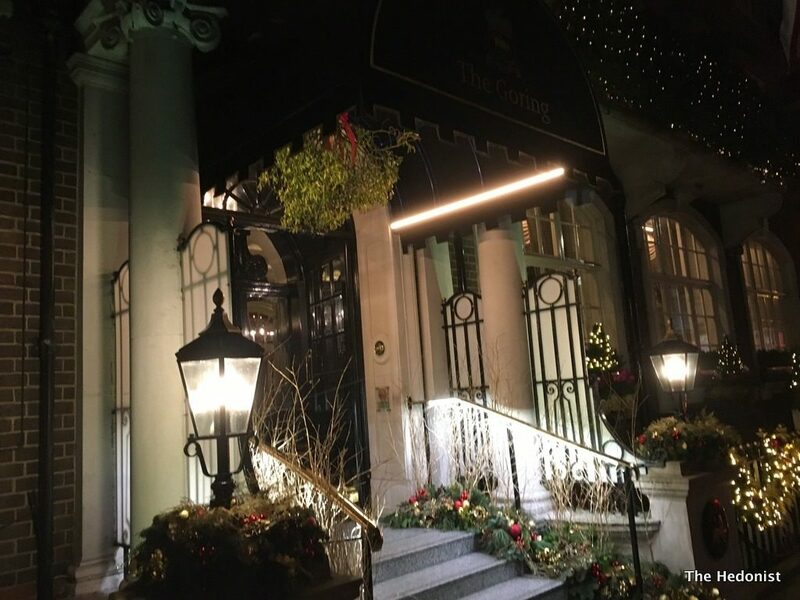 Having just received its first Michelin star it sits in London’s last remaining family-owned luxury hotel – The Goring family have run the joint for over a hundred years so must be doing something right. The David Linley designed room is white, airy and elegant with slightly tacky Swarovski chandeliers adding nighttime sparkle. For many years the restaurant had the reputation of being the dowager princess of the London scene – much loved but slightly stuffy. It’s no surprise that it was allegedly the late Queen Mother’s favourite. But Executive Chef Shay Cooper has brought a lighter touch to the menu of British classics gaining a Michelin star in the process. There is no à la carte menu with the only option being a 3 course set menu at £64 so it was that her Ladyship and I went for. Things opened promisingly. A smooth young chap pushing a trolley laden with champagne bottles turned up and started his sales pitch. Building to a crescendo of excitement he presented the final bottle for my perusal – Krug Grande Cuvée Brut at £46.00 a glass. Except the price wasn’t made clear and I hadn’t had time to investigate the wine list. So I chose the Lanson Noble Cuvée Brut Blanc de Blancs, 2000 at a meagre £25.00 a glass. I wasn’t paying the bill and didn’t want to go over the top and knew the Lanson to be delicious. The young chap who was not pleased that his pitch had failed, looked down his nose at me and after serving shoved the trolley with such force that the bottles clattered and ice spilt all over the floor. This shouldn’t happen in a 5 star hotel. 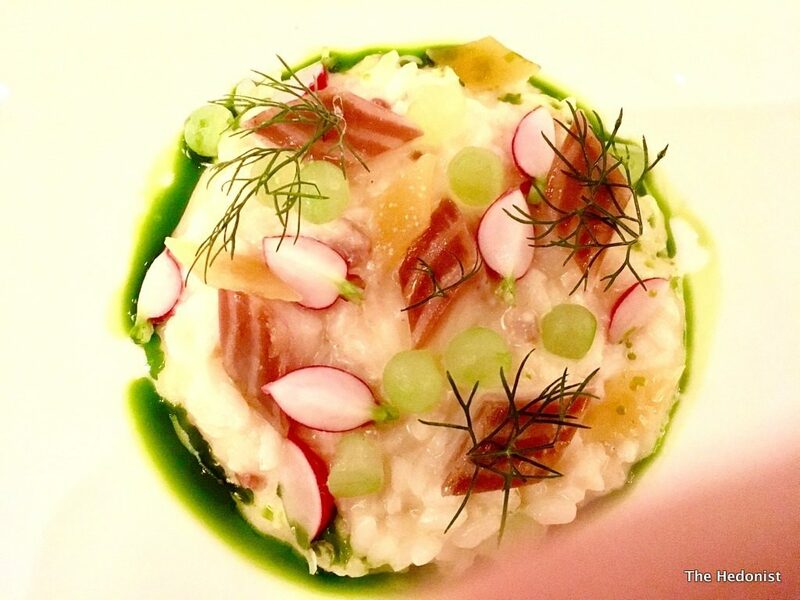 After this misstep a beautifully balanced and plated dish of smoked eel risotto, preserved lemon, cucumber and lovage oil made things considerably better. 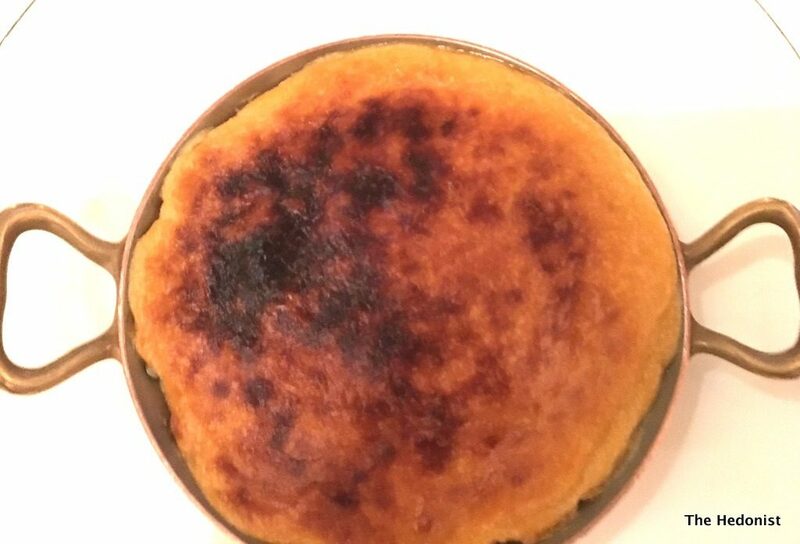 The rice was nutty and resistant to the bite making a creamy base for the dense smokiness of the eel and the perfume of the other ingredients. In other news I had ordered a bottle of Austrian Grüner Veltliner, Lössterrassen, Weingut, Stadt Krems at £49. It retails at about 8 euros which give you some idea of the mark-up. It was insipid and I mentioned my dissatisfaction to the sommelier who commented that it was of course an entry level wine…at £49… Having recently drunk some excellent Grüner Veltliners at around the €25 price point in Berlin I had the feeling that the pricing was less than democratic. To be fair to the sommelier he comped us a couple of glasses of fizz. 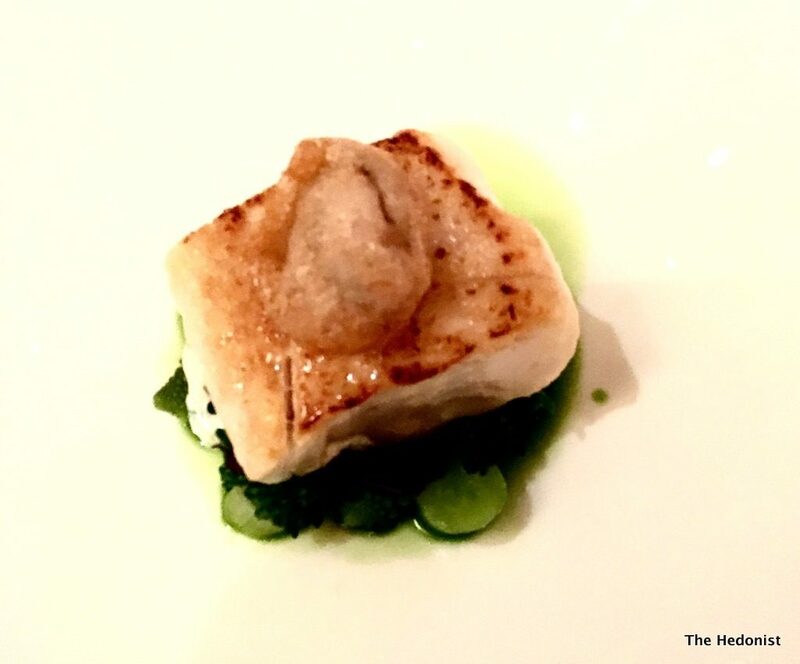 Roast cod, crispy oyster, cucumber, horseradish and parsley was a beautifully cooked piece of fish with the battered oyster adding some crunch and sweetness and the herbs and cucumber giving the dish a grassy vegetal quality. I was really excited by the idea of the glazed lobster omelette, which came with excellent fluffy, crisp duck fat chips and a peripheral lobster Caesar salad. It was a little overdone which detracted from its luscious, creamy lobsterness. 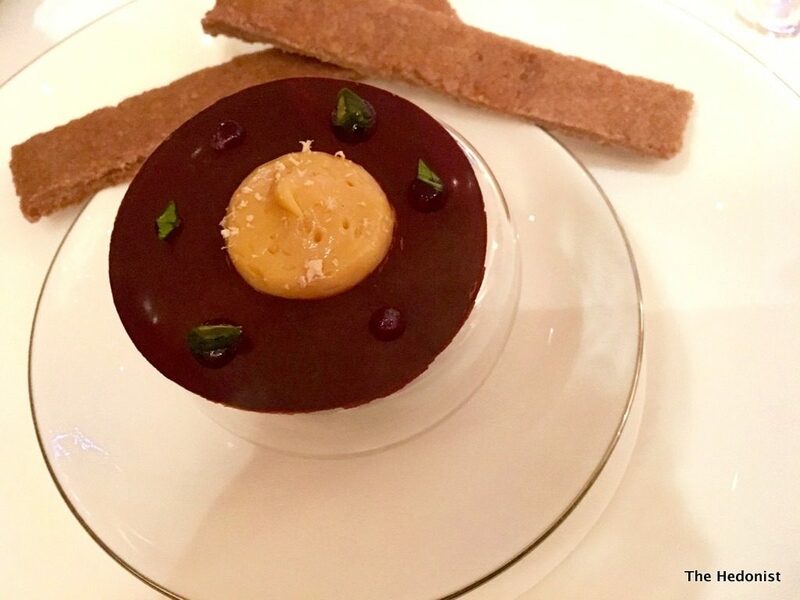 Black fig trifle,with gingerbread, caramel and buttermilk was a darker, richer version of the classic – it was the Gina Miller of desserts. Smart and very tasty. 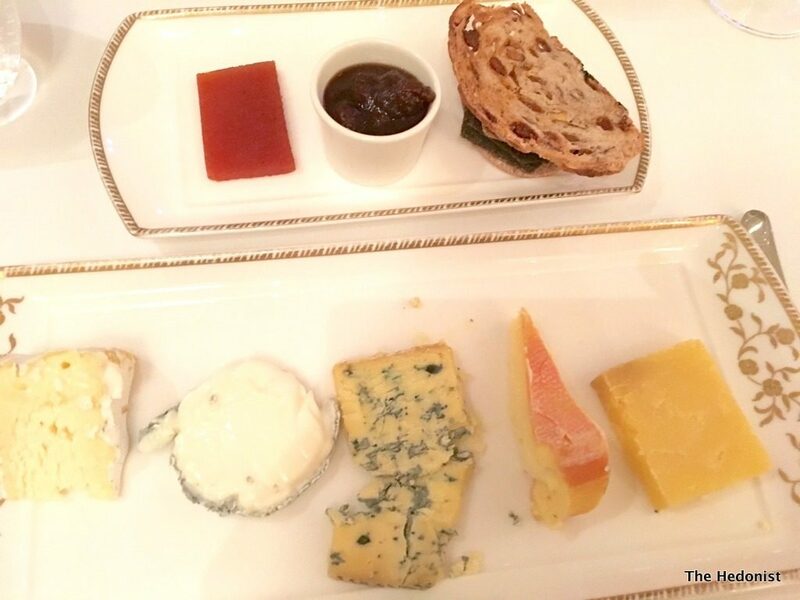 The British cheese platter was beautifully kept and a testament to the quality of the cheese in this country. 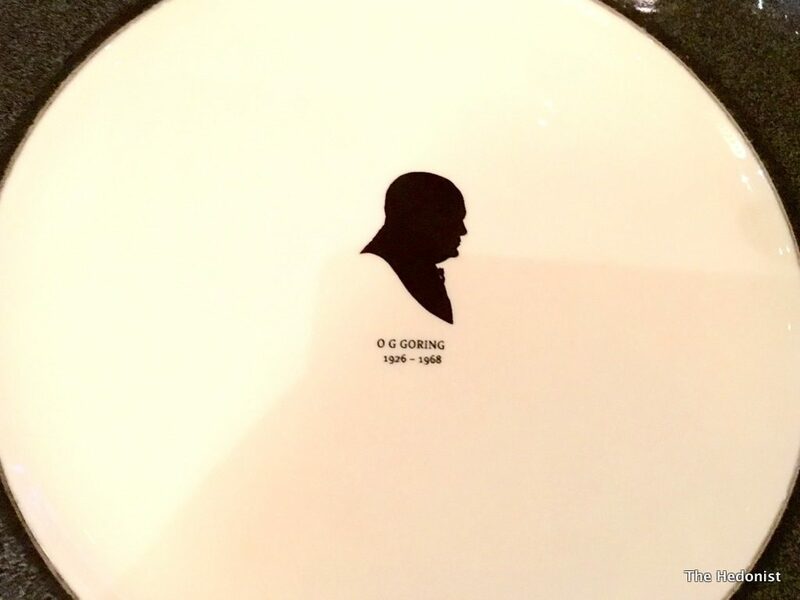 I’m not the market that The Goring wants. I don’t have that level of disposable income – But I’ve eaten at El Bulli, Noma, Pierre Gagnaire and other great restaurants where I’ve never been made to feel like I shouldn’t be there. It’s a shame. Good food and hospitality will never be cheap but shouldn’t be divisive.